The purpose of NASA’s OSIRIS-REx spacecraft—Origins, Spectral Interpretation, Resource Identification, and Security–Regolith Explorer—is to map and return samples from asteroid Bennu, a carbon-rich hunk of rock that might contain organic materials or molecular precursors to life. It is also an asteroid that could someday make a close pass or even a collision with Earth, though not for several centuries. The OSIRIS-REx spacecraft is expected to reach its asteroid destination, Bennu, in December 2018, with approach operations starting in August. 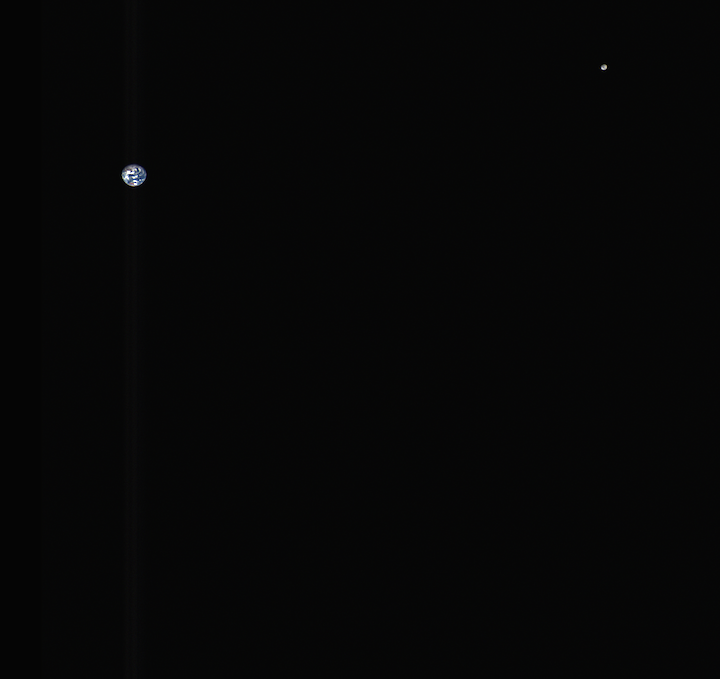 This composite image of the Earth and Moon is made from data captured by OSIRIS-REx's MapCam instrument on Oct. 2, 2017, when the spacecraft was approximately 3 million miles (5 million kilometers) from Earth, about 13 times the distance between the Earth and Moon. (Click here to see the geometry of the shot.) Three images (different color wavelengths) were combined and color-corrected to make the composite, and the Moon was “stretched” (brightened) to make it more easily visible.